Although it’s been 3 days since I flew home from Orlando, Florida (where I was covering a medical conference), I’m still wearing a huge smile. It’s partly because of the mostly sunny weather and temperatures in the high 70s — an especially important perk for this super-sick-of-winter gal. 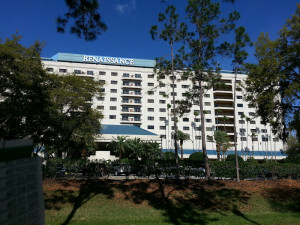 But it was also because of my 4-night stay at the beautiful and friendly Renaissance Orlando at SeaWorld hotel. 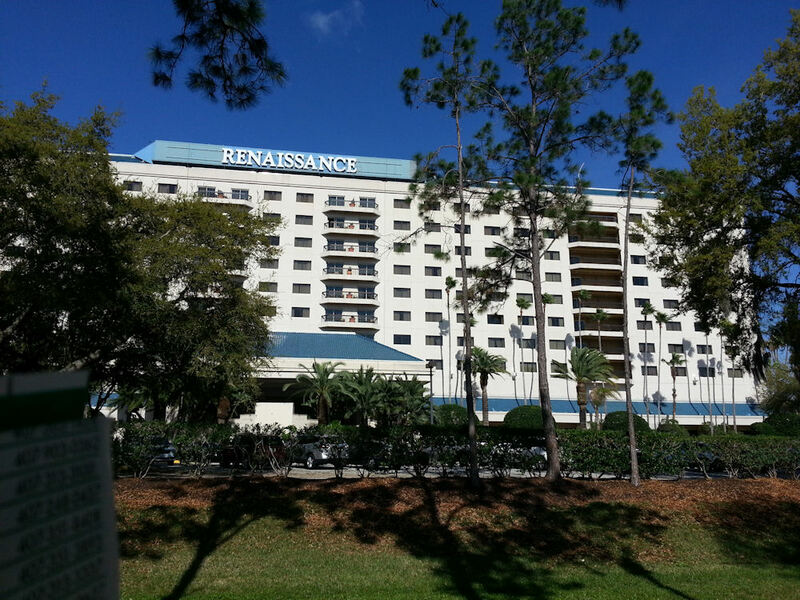 This Renaissance hotel is actually located across the street from the SeaWorld Orlando theme park on Sea Harbor Drive and is just off the super touristy/super fun International Drive (also known as I-Drive) that houses tons of shopping areas, wildly themed restaurants such as B.B. 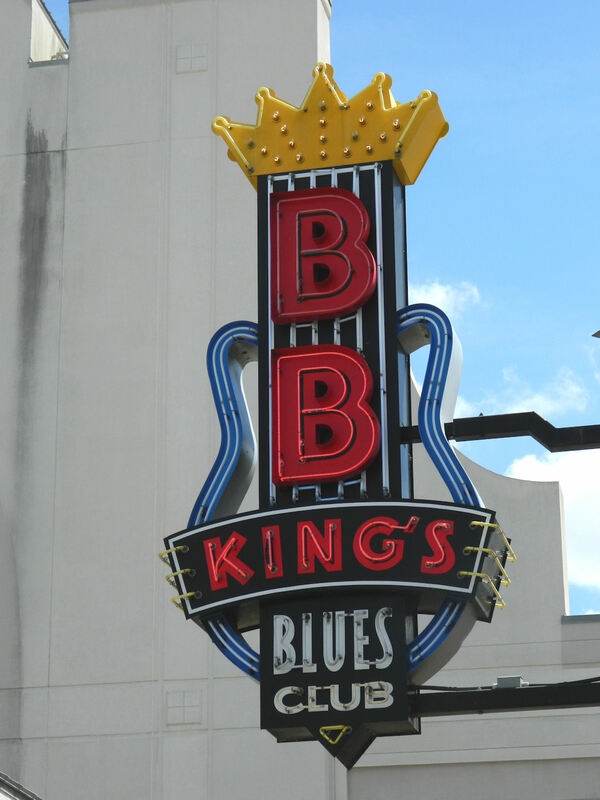 King’s Blues Club, and attractions such as Ripley’s Believe it or Not Odditorium, the Titanic Exhibit, and the WonderWorks hands-on science museum. 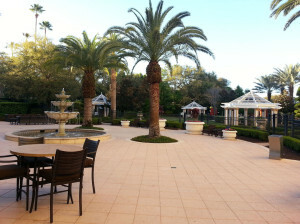 All of which can be easily seen by jumping on the I-Ride trolley, which picks up right in front of the hotel and costs only $5 for an all-day pass. 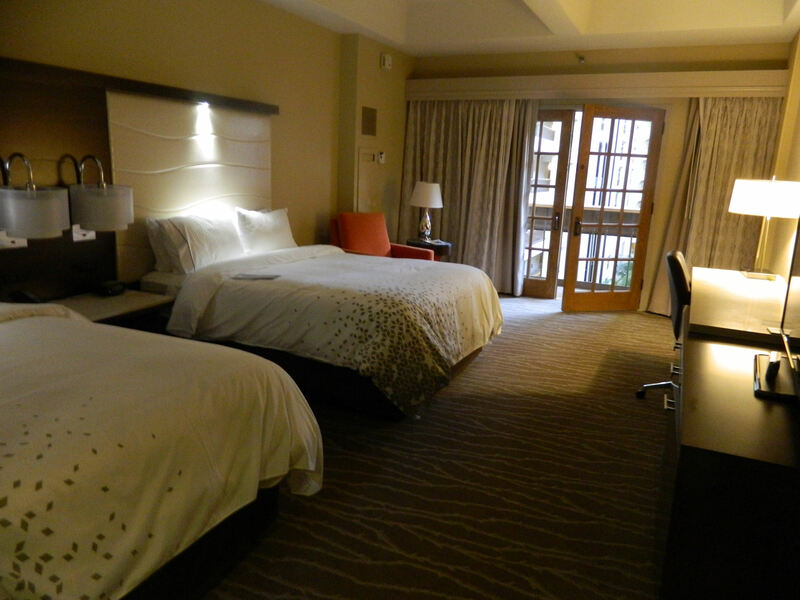 As the host hotel for the conference I was attending, I knew the Renaissance would be pleasant and set up well for the business traveler. But I wasn’t expecting it to be so pretty and to offer so many wonderful areas to just take a minute and relax at both inside and out. 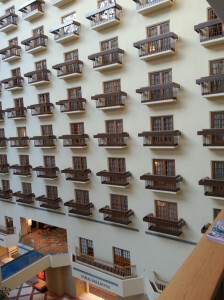 After checking in, the first thing I noticed was the 10-story glass-topped indoor courtyard at the center of the building that houses the hotel’s restaurants and bars, as well as colorful, comfy seating and work areas strewn all about. But the best part of the room was that it had what may have been the most comfortable bed I’ve ever slept on! And the down blanket was light but warm and soooo soft. I later found a brochure letting me know I could order one of these beds or the bedding for myself. Although I know I won’t be forking over $1500 any time soon for a new bed, I am considering saving up for the blanket! 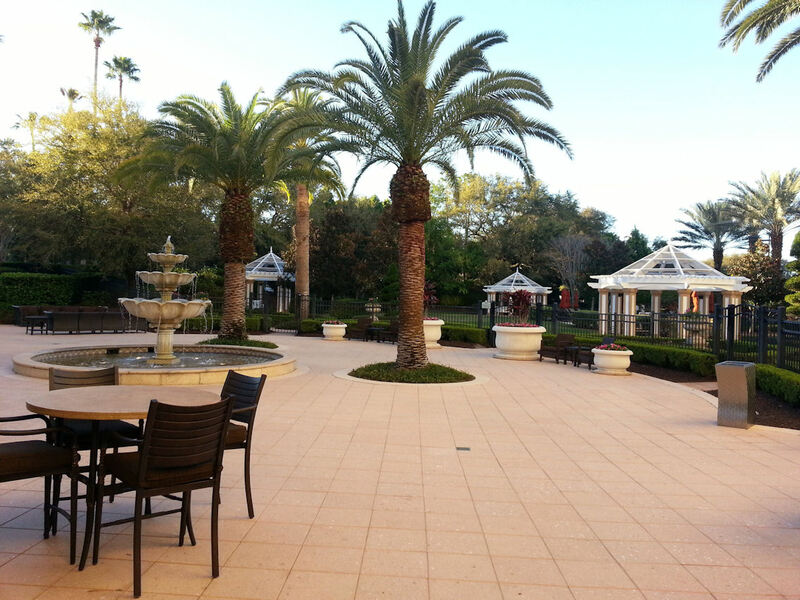 After looking over my room and dumping off my suitcases, I all but ran outside to take advantage of the warm weather and to check out the hotel’s exterior areas. 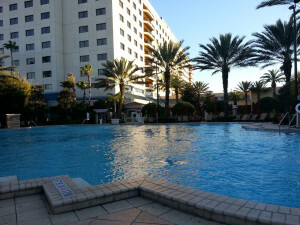 I quickly found the large pool, which was surrounded by dozens of bright blue and red and tan chairs and umbrellas and small cabanas, 2 jacuzzi tubs, and an always in use ping-pong table. After getting a little sun, I got a drink and talked with the staff at the outdoor bar. When they heard that I was craving fresh seafood (not getting it often is a hazard of living in a land-locked area! ), they recommended I try the Tradewinds Restaurant inside the hotel. And with that suggestion, they became my new best friends. 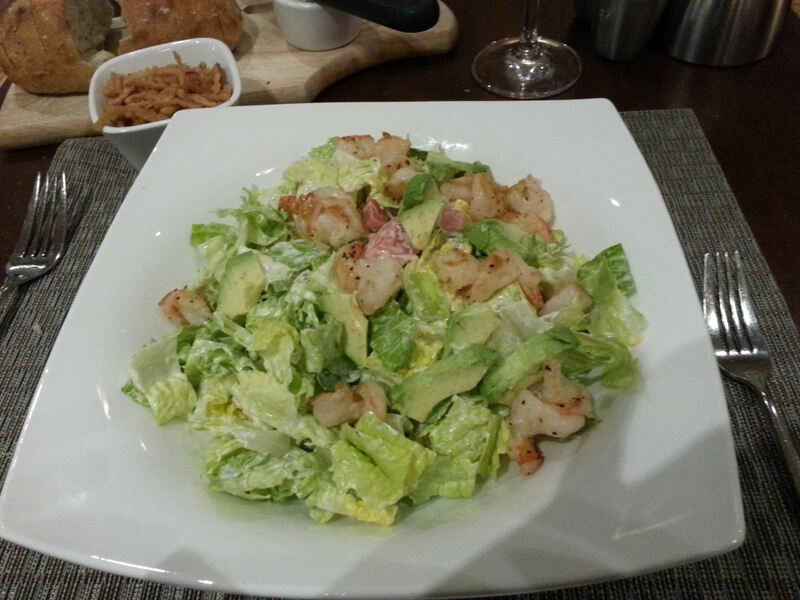 I ordered the grilled shrimp salad, which came with fresh avocado, crunchy onion ring-like bits, tomatoes, roasted corn, a creamy house-made dressing, and a bunch of wonderfully plump, very sweet grilled shrimp. It was so tasty, I actually ordered it twice more during my stay! The following days were very busy and a bit of a blur while running from meeting session to meeting session. But the hotel staff was always friendly and helpful, the food was superb, and that outdoor jacuzzi was a great place to soak sore feet each evening. 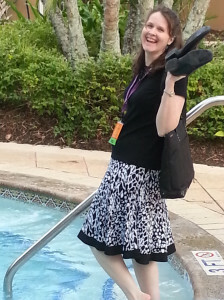 In hot water at the end of my last conference session. It was Heaven! 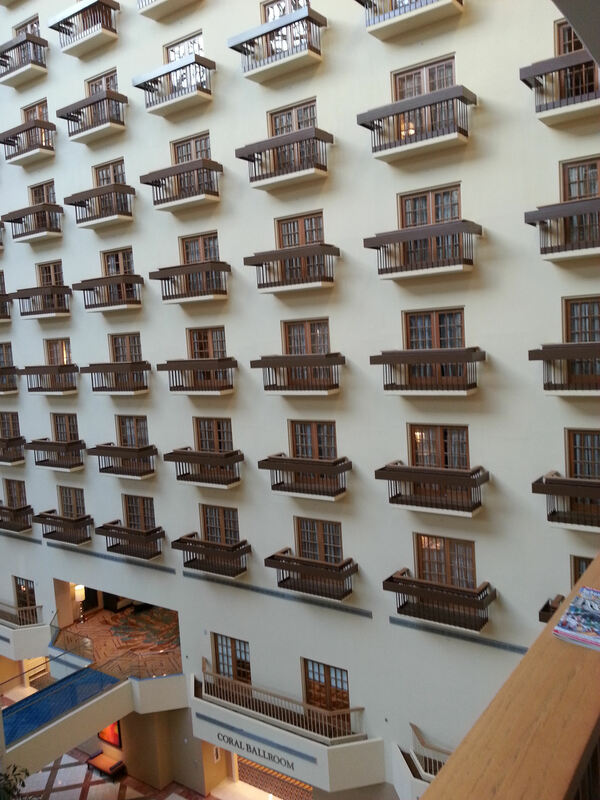 For now, I’ll just say that I highly recommend staying at this hotel for anyone. There were a lot of families there, in addition to the convention attendees. But kids and parents and business travelers all seemed to co-exist amicably in a very calming yet fun setting. My overall rating? Two thumbs way up! After a very long, cold winter around most of the country this year, your trip sounded like a little slice of heaven. 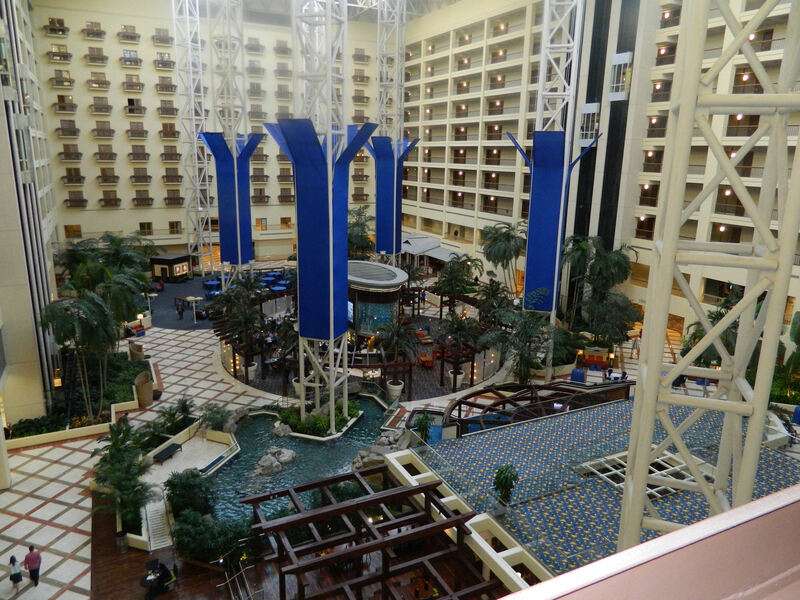 It is always so good to hear good things about hotels and makes me want to try this one next time I visit Orlando. I don’t think you could go wrong here. It’s sooo close to everything fun, yet super quiet inside. 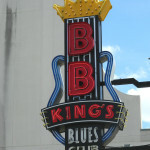 I’m ready to go back!